As manufacturers continue trying to make vehicles lighter and safer, the industry must keep up with all the advanced metals coming into the market. 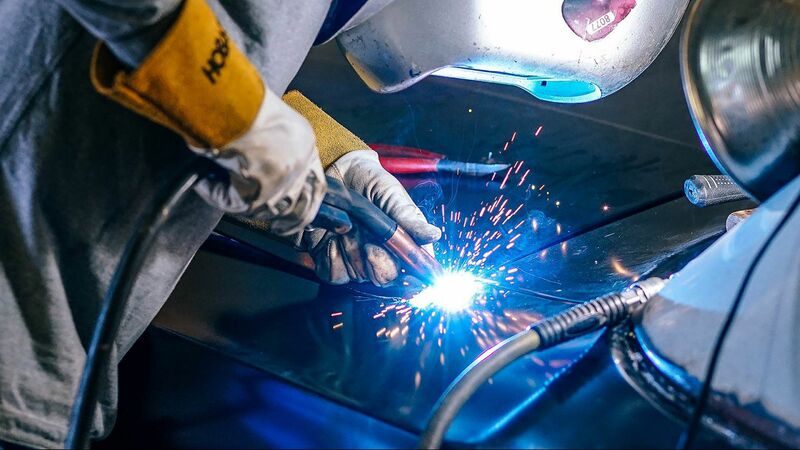 With more cars switching over from traditional steel to high strength steel, aluminum, boron, etc., we wanted welders that were modern and easy to use. It's very important in a bodyshop to have an easy to use system, that consistently produces factory assembly line quality welds. Our car body repair spot welder is a Tecna 3664 DC current welding station with inverter technology. It's considered the most advanced on the market. The machine is fully automatic when in smart plus mode. The welding control is able to automatically recognize the type and thickness of the sheets to be welded, from sensors in the gun. This eliminates operator error as the software automatically sets specific welding parameters to ensure the best quality welds, without having to rely on a specific skill set. By means of a flash drive, it's also possible to upload OEM specific welding programs. If a fault is detected, the machine will compensate for this fault, or if it's not possible to perform a welding procedure, information is displayed explaing the fault. Our Body Mig welding machine is a Cebora Jaguar double pulse machine. This machine is capable of welding and mig brazing galvanized sheet metal, high strength steel and aluminum alloys. This machine carries approvals from BMW, Tesla, and Ferrari to name a few.